Open to the public, our Wednesday Night “Rabbit Races” are informal races utilizing a Rabbit start, i.e. no race committee. The race course is around the local racing marks outside of the Marina. Due to the physical nature involved with sailing, we recommend that you not bring along children under the age of 14. Arrive at approximately 5:30 PM to sign up as crew, and select your dinner choice. Boats depart the docks at approximately 6:00 PM and are typically finished by 8:00 PM. Our fabulous group of volunteers prepares dinner while we are out on the water, so as soon as the boats are put away, it’s time to grab a drink, tuck into some dinner and socialize with the sailors! How to Dress and What to Bring: Please bring non-marking boat shoes, (tennis shoes), and dress in layers–a simple sweatshirt won’t do much against the wind. Appropriate attire would be jeans, a turtle-neck shirt, a sweater, and a windbreaker jacket. A stocking cap is recommended, as it can get windy very quickly. It is highly recommended that you bring a change of clothing just in case you get wet. If you have a life jacket, bring it along; your boat skipper may have extras, but you should have one just in case. A watersports vest works fine. Etiquette: When you sign up to crew on someone else’s boat, always be honest and realistic about your experience level. This helps us to best match up skippers with crew. Always listen to your captain’s directives–they have your safety at heart. An after-race “thank you gift” (i.e. – a beer up at the bar!) for the skipper that took you out on the water is always appreciated. What to Expect as Crew: Depending on your experience level, you may be asked to do some physical work, such as grinding winches or pulling sheets. When the boat tacks (changes direction), you may need to move very quickly in a small, crowded area, or move to the opposite side of the boat. Be aware of your surroundings–especially the boom (horizontal part holding the base of the sail)–it can change directions unexpectedly! You are responsible for your own safety on the water! 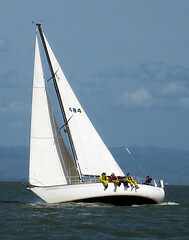 Skippers: In order to participate you must either register on www.jibeset.net or complete and sign the Skipper Release Form prior to racing. Crew: All crew members must complete and sign the Crew Release Form prior to racing. Please complete these forms and either bring them to the skippers meeting or email to regatta@cpyc.com before the race. Extra release forms will be available at the Club. Email regatta@cpyc.com for more information. Winter Races are held on the second and fourth Sundays of January, February, and March. Meet in the Regatta Room at 12:30 PM to sign up as crew. Boats typically leave the docks at approximately 1:00 PM, and races are typically finished by 4:00 PM. For those who become more serious about the sport, arrange to crew on a boat during the monthly CPYC regattas which are typically held the first Saturday of the month. May I try this? Is upcoming Wednesday OK?